The Power of Your Brand. Broken toddler language of a 2 1/2-year-old can sometimes be challenging. After a couple of minutes of trying to understand why “cars” didn’t satisfy this “I want cars” conversation, I realized what he really wanted from his Aunt Deanna. He wanted “cards”. At my house, I have a drawer of playing cards and his cards are in a plastic bag. 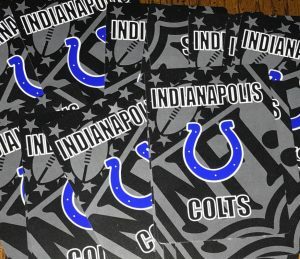 As I opened the drawer to hand them to him, he said “no” and pointed to my cards that had the Indianapolis Colts logo on them. With the season going the way it has been, what difference does it make if grimy little hands bend and rip them now! haha So after confirming it was those particular cards he wanted, he jumped up and down and said “football”. I was amazed that his little brain knew that the horseshoe logo meant football. When people look at us and our lives, what does our life look like to them? Does our brand as a person bring as much joy to others as that little horseshoe brought to Karter? Do people look at us and see Christ and a genuine loving, caring and kind person? Or is our brand looked upon as a grouchy, never-happy, selfish person? It’s up to us today. It’s time to show our Christian brand for what it’s worth. It cost a man His life but it’s worth an eternity in heaven. Will you wear the brand proudly today so that others will want to have it, too? Ephesians 5:1-2 – Therefore be imitators of God, as beloved children; and walk in love, just as Christ also loved you and gave Himself up for us, an offering and a sacrifice to God. This entry was posted on October 23, 2017 with tags: #imitatorsofChrist, #indianapoliscolts, #makeadifferenceeveryday by Deanna Young.